This post is about something very special. It’s about love letters. Old love letters. 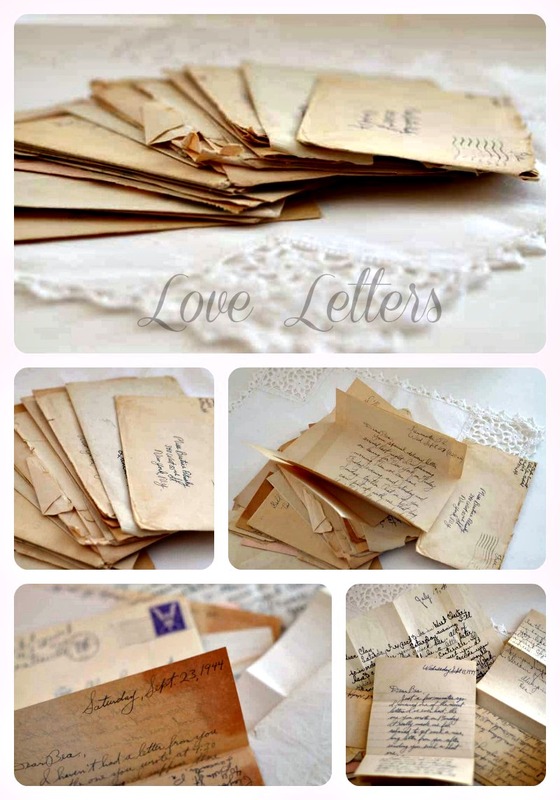 Very old love letters. 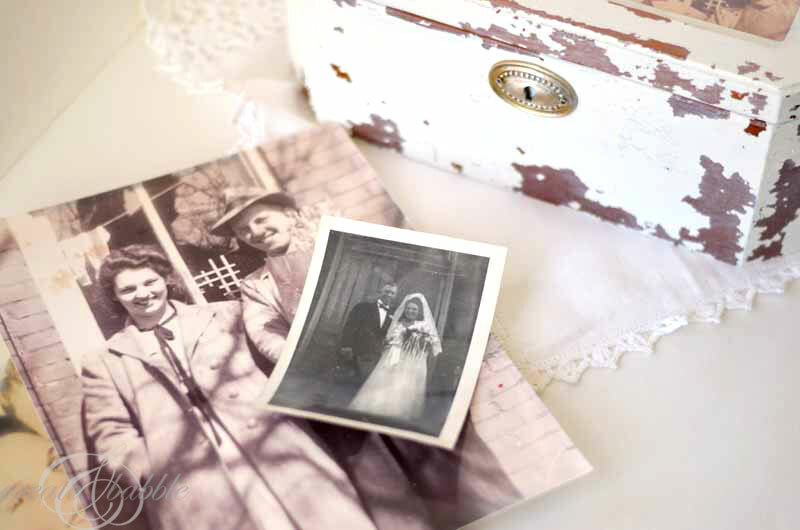 They are so old and so special that they deserved to be stored in a special DIY vintage love letter box. 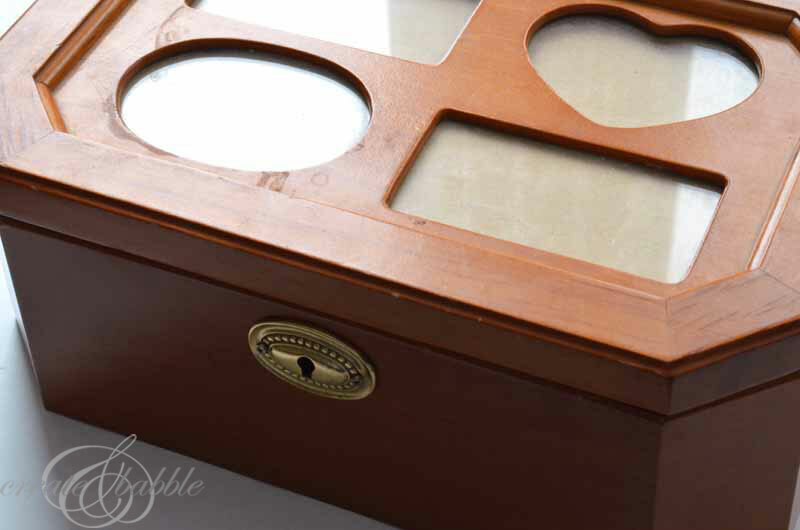 I’ll show you how I turned a jewelry box into a lovely vintage-looking love letter box. But first take a look at the letters. These love letters were written and exchanged by Dan’s parents 70 years ago. Some were written before they were married, and some were even written after they were married. I think I can hear a collective: Awe! These letters were found, along with old photos, jammed in boxes that Dan brought over to our house after his father passed away a few years ago. Dan brought the boxes upstairs to sort through them this weekend and I knew immediately that I wanted to make a special box to hold these letters. I remember seeing this jewelry box from when my daughter was getting ready to move out and was cleaning out her room. I rescued it from the throw-away pile knowing that someday I would do something with it. 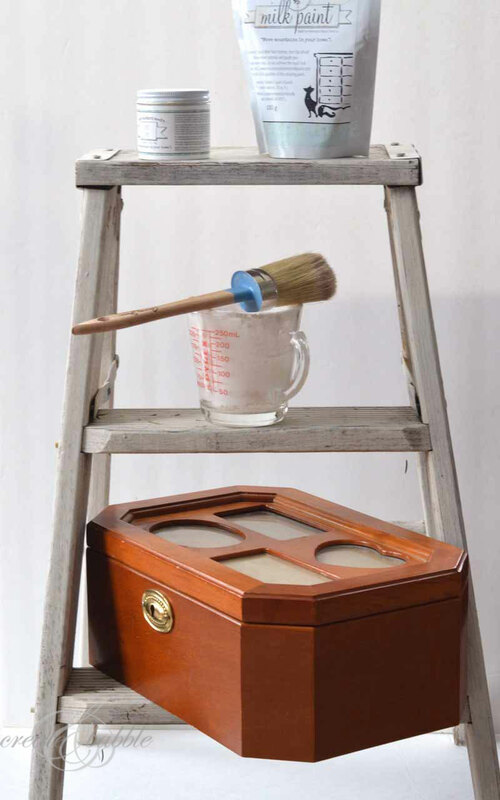 I have a bag of Miss Mustard Seed Milk Paint in Ironstone that I thought would be perfect for this box. I gathered the rest of my supplies and got to work. I’m a relatively new user of MMS Milk Paint and thought a small project like this would give me some practice before using it on a piece of furniture. I removed the hardware and gave the dusty box a good cleaning with a damp rag. I applied another coat of milk paint and look at that! Chippy, flaky paint. Perfect. Just the look I was going for. After the paint was thoroughly dry (I waited a few hours), I ever so lightly went over the box with a sanding sponge. Just to remove the loose flakes. Then I brushed on some of Miss Mustard Seed White Wax and buffed. Inside of the lid, I placed a monogram of Dan’s parents’ initials. I used my Silhouette Cameo to cut the monogram out of Silhouette silver vinyl. On the outside of the lid, there are four cut-outs for photos. Using my iPhone, I snapped two pictures of old pictures and printed them to fit the size of the cut-outs. For the other two cut-outs, I browsed google images for free vintage valentine images. After cutting out the images, I antiqued them by rubbing the surface with an ink pad. 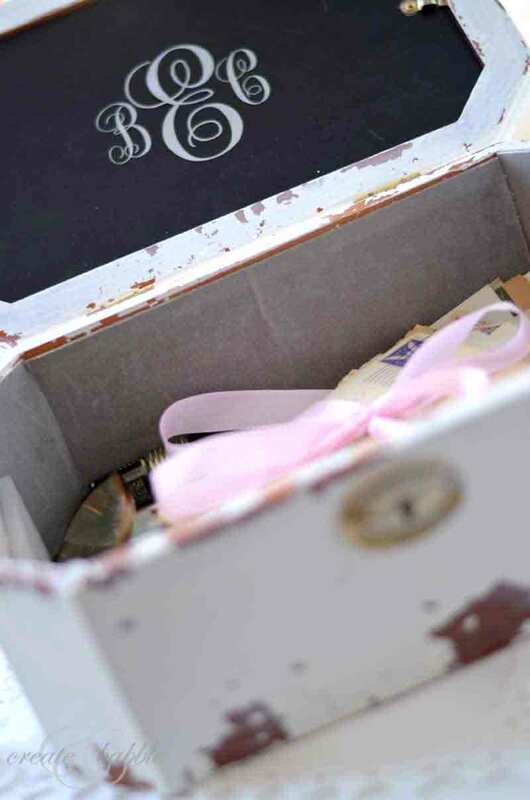 I tied a pink ribbon around the letters and placed them in the box. Writing this post has got me thinking about how we communicate today. Is writing love letters a thing of the past? I hope not. I think I just might write a love letter. On paper. With a pen. Do I have paper? Of course, but no stationery. 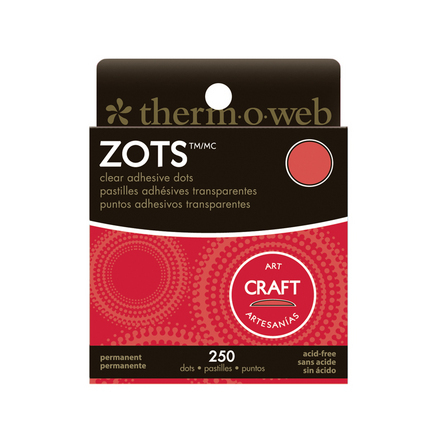 Do you have any love letters in your house? Maybe your parents or your grandparents? I have a vague memory of seeing love letters written by my grandparents or great-grandparents that my mom showed me many years ago. I wonder if they still exist. I’ll have to ask my sister. I remember thinking how beautiful was the handwriting! Oh how wonderful that you still have your letters! I would love to see the box you make! Thank you Heather! I’m so glad we found them and even more thankful that his parents saved them for all those years. 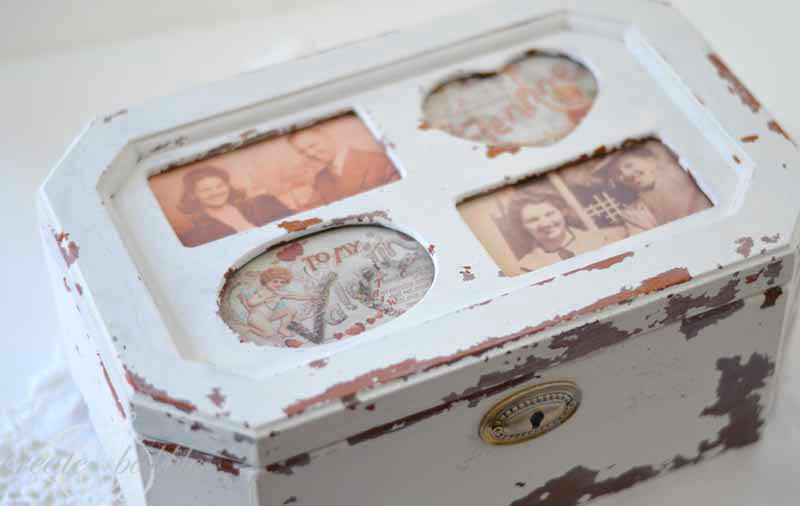 What a wonderful way to preserve special mementos, Jeanie! 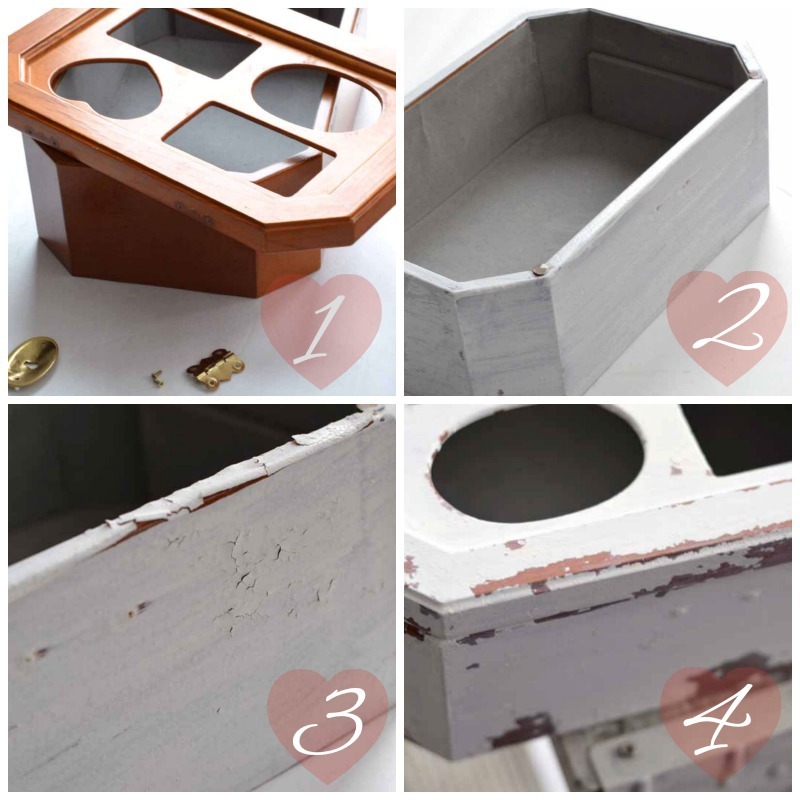 The makeover of your little box is perfect. I love that you included the interior in the makeover too. I have letters that parents wrote prior to their marriage (around the start of WWII) and even have one that my mother wrote to my father’s mother asking her permission to write to him while he was stationed overseas with the Army. 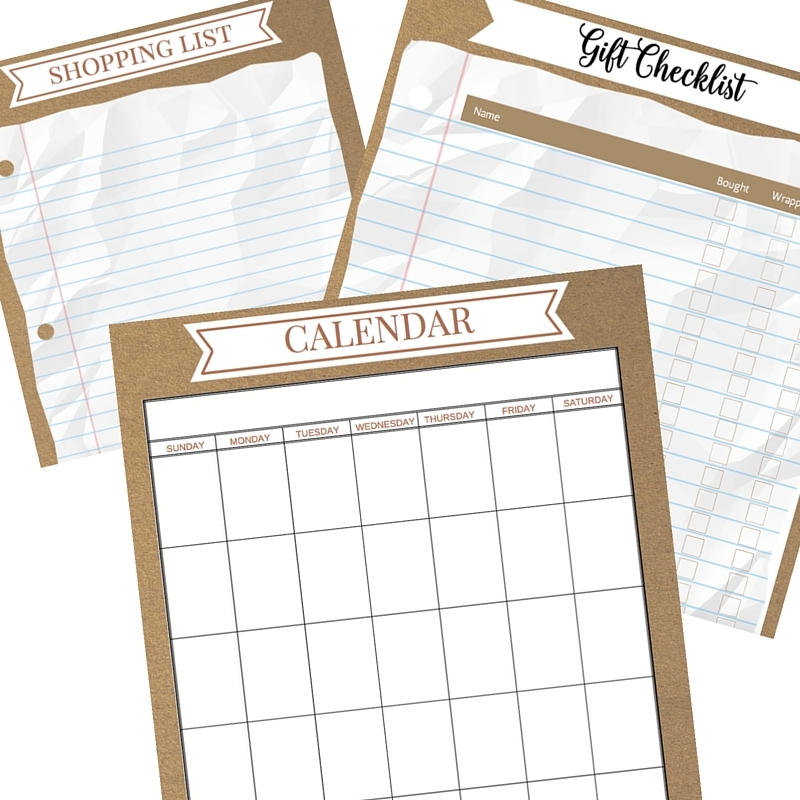 This gives me a great idea for storing them where they will be easily accessible instead of stuck in a box somewhere. Love it and thank you for the inspiration! Thank you Suzy, for your kind words! I felt like it was a honor to make a special box for these letters. As I was reading through the letters, I felt like I was in a different world. They were so pure and sweet. Wow, can you imagine receiving a letter today from someone asking permission to write to your son? Thank you Christy! We feel so lucky to have those letters. What a wonderful keepsake for your husband. I love reading my grandparents’ old love letters, and I’m sure there are some from my parents to one another in their attic. Sadly, I’m not sure there will be any to leave behind for our son since most communication today is done via email… and I don’t think it has the same meaning/impact as handwritten love letters. Maybe I need to write one, too. Thank you Amy! I know what you mean about communication today. I have some cards from Dan that he hand wrote in messages. I am definitely going to round them up and find a special place for them, too. I hope you do write a love letter! Absolutely love this project! I have some old letters of from about 40 years ago of my sister’s, who has now passed away. They don’t look vintage but they are still a treasure! Great job and thanks for joining us, Jeanie! Thanks Marty! It seems that nowadays, anything that is handwritten is a treasure. 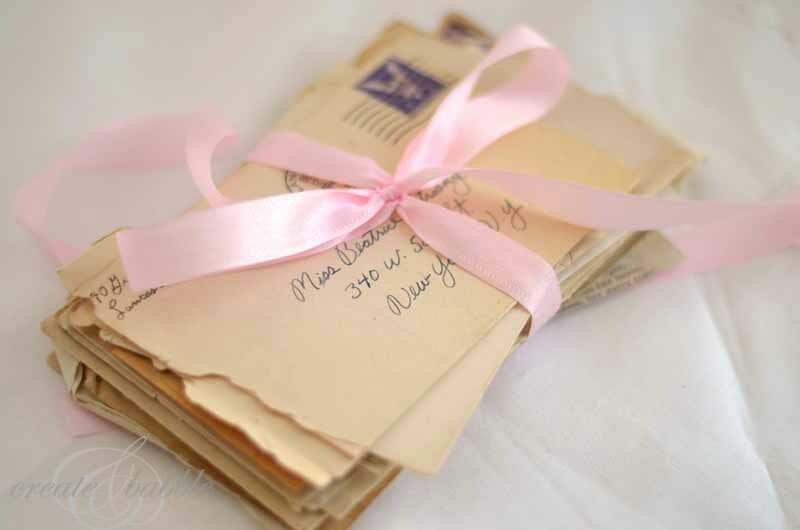 How wonderful that you have letters from your sister to treasure. yes you are hearing the awwwww’s. this is so perfectly romantic and special. Love this kind of stuff. Thank you Laura, I’m a lover of all things romantic, too, and reading those letters brought tears to our eyes! You sure were right about that collective awe. How sweet and what a wonderful way to honor them. Thank you so much Jamie! I appreciate the share! Thanks Ang! I hope you do write a love letter! You are so fortunate to have those letters! I agree they needed a pretty box and you did a beautiful job! Thanks Anne! We are fortunate indeed to have the letters. Jeanie — what a cool way to honor your family’s legacy of love! Sharon Rexroad’s Bringing Creativity to Life recently posted…Glitter Mason Jars & Dollar Store Candlestick How-to + Free Silhouette File! 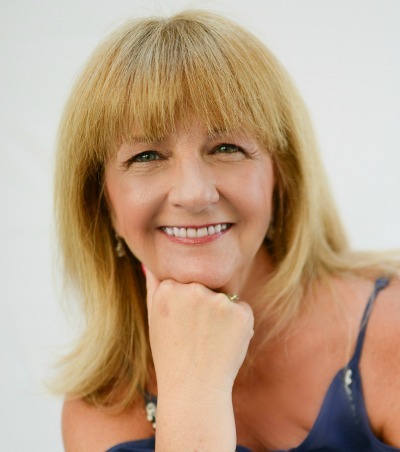 Thank you Sharon, and what a nice way to put it: legacy of love! That’s awesome! What a beautiful box you created!! I too am sad about the decline of hand written letters but find that I’m just as guilty of hastily tapping out an email rather than taking the time to sit and write out a hand written letter. I continue to aspire to writing more letters and notes by hand though. Hopefully, bit by bit, I will incorporate this back into my life. Thank you for inspiring me with that wonderful treasure of letters! This is the cutest idea. It such a nice little place to keep those valuable letters! Danelle – Tattered Treasures recently posted…Another Collection!! !